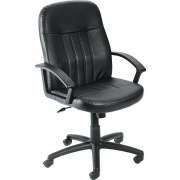 Ergonomic leather office chairs are designed for busy, prominent executives. Their luxurious look and feel is worthy of any professional setting. 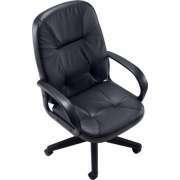 When an executive has an elegant executive leather office chair to sit in, the work day becomes much more pleasant. Clients and colleagues are sure to be impressed by this imposing piece of office furniture. 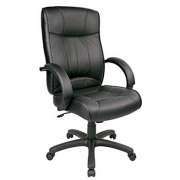 What is a good leather chair for your office? 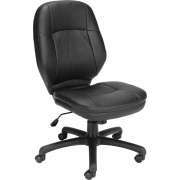 Hertz Furniture offers you high quality, relaxing leather desk chairs. Our models have distinctive designs, and a variety of styles that will create a professional environment in your office, or conference room. 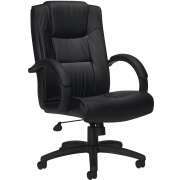 Nothing exudes confidence and expertise like a leather executive chair from Hertz Furniture. 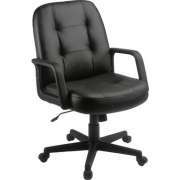 What should I look for in a leather office chair? While having a leather office chair can make any professional’s experience in the workplace more enjoyable, there are other aspects of the chair which should be carefully-selected as well. 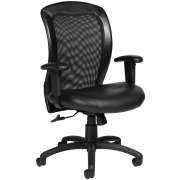 Ergonomic office chairs are a must-have in today’s computer-dependant workplace. 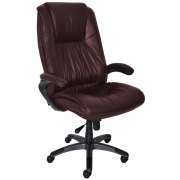 They are specially designed to give executives and entry-level employees the proper support and positioning they need to stay comfortable throughout the day. 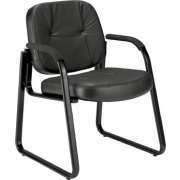 An ergonomic chair has special features and adjustments that create a custom fit for each person. 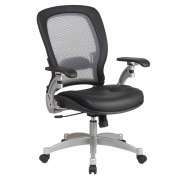 Pneumatic seat-height adjustment makes it easy for executives to sit properly with feet resting flat on the floor. 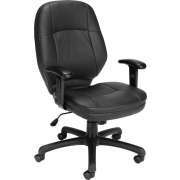 An adjustable tilt angle and armrests facilitate correct positioning while extra lumbar support and headrests provide reinforcement where it is needed most. 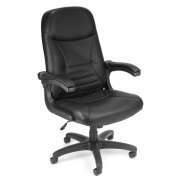 What kind of leather should I get for my office chair? Not all leather is created equal. 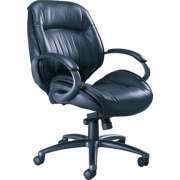 While every executive would probably love to have the highest-quality and most luxurious leather executive chair, many companies are limited by budgetary constraints. 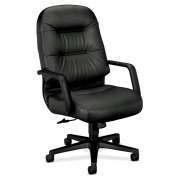 Hertz Furniture’s wide selection of leather office chairs provides a spectrum of leather-based materials that will fit almost any budget. All of our leathers and imitation leathers are attractive and durable. The most budget-friendly option is the faux leather, which looks and feels like the real thing, although it is synthetic. Bonded leather features a combination of leather and other fibers for a luxurious appeal. Top-grain leather is thinner and more pliable than full-grain leather, which makes for great upholstery. 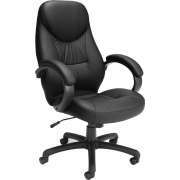 Which other materials look good on a leather office chair? While leather has the classic appeal that is associated with professionalism and expertise, there are other materials that are becoming increasingly popular in the modern office. To get the best of both worlds, a company president or school principal might opt for an office chair that features a combination of materials. 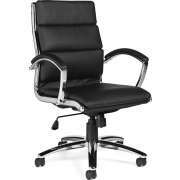 We have leather desk chairs that have mesh backs with leather seats and accents. With this arrangement, you get the luxury of leather and breathability of mesh for a dignified appeal and practical comfort. 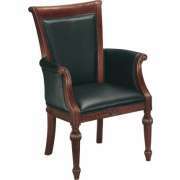 Another great material that can really bring out the natural beauty of a black leather chair is wood. Wood accents complement the upholstery material beautifully and bring some natural color into the workspace. They can be coordinated to match office desks and other office furniture. 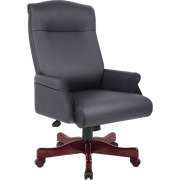 What kind of guest chairs will coordinate with my leather executive chair? While everyone should feel comfortable and supported in their own office, it is also important that guests, clients and visitors have a cozy place to sit. 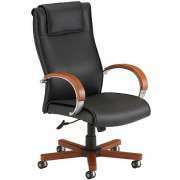 Leather guest chairs can be coordinated with the executive’s office chair so everyone has some supportive seating. When guests are treated to first-class elegance, they will understand that your company cares about them and will be impressed with your sense of style. Guest chairs come in a selection of styles so you can choose whether you prefer a modern or classic appeal. Traditional guest chairs from Better Built Quality are hand-tufted and trimmed with individual brass nails for a unique old-world charm. Leather captains chairs also enable a professional to express personal style while maintaining a professional work space. For startups and other modern-style offices, we have a number of contemporary styles with leather upholstery and ample padding. At Hertz Furniture, we know that where you sit throughout the day impacts your experience in the workplace tremendously. Our leather office chairs are designed to give executives the support and luxury they deserve to get the job done right. Our wide selection of models comes from first-rate office furniture manufacturers including Boss, OFM, DMI, Eurotech, Offices to Go and Global.